It's a glorious September day, cool and breezy. The leaves have just begun to change against a deep blue sky. I should be out walking or biking but I'm recovering from a cold, so when I got home from work, I decided I needed some more rest. Perhaps the demands at work have prompted me to do a few small (read "instant gratification") projects: bracelets with beads. I haven't made these for a while. 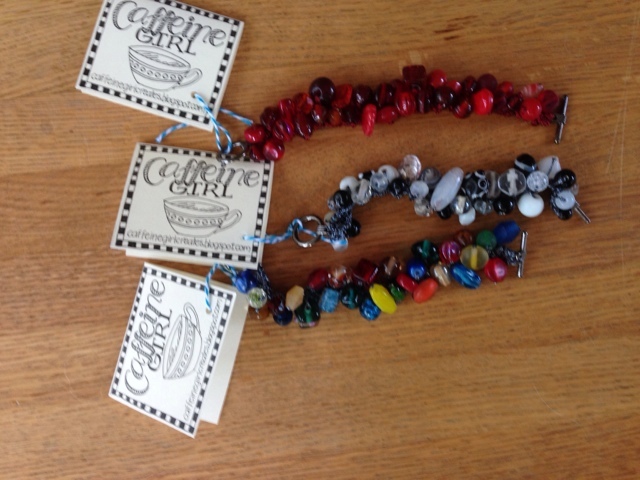 I was so pleased with the way they came out that I decided to attach some tags and see if I could sell them. 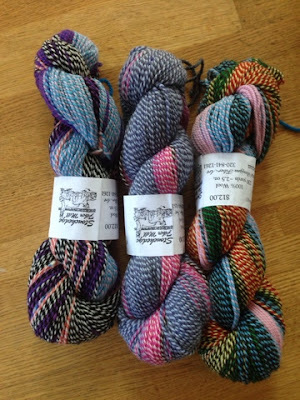 I headed to the new Knitcircus store here in Madison and left a box of them for owner Jaala and her staff to consider. I have my fingers crossed! These are fun to wear and pretty dramatic, as well. I like making things like this where each item is one-of-a-kind. So much of our world is mass-produced that it feels good to make and wear unique items. While I was at Knitcircus, I couldn't resist a couple skins of Green Bay Packers-colored sock yarn. I don't do spectator sports, but I know a number of Packers fans who would appreciate these -- though I haven't yet decided who to gift them to. It doesn't count as stash if you cast it on right away, right? 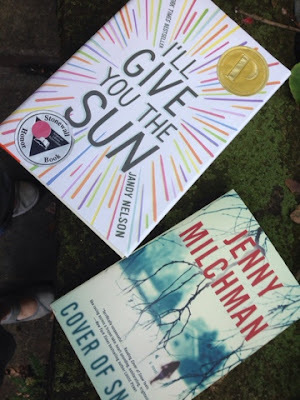 I'll Give You the Sun comes highly recommended by one of the 8th-graders at my school, while my friend Marsha recommends Cover of Snow. I hope one of them takes! I hate being bookless. 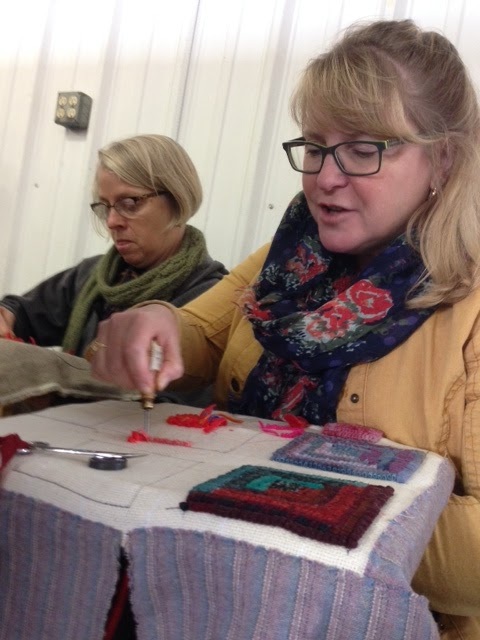 I'm joining up with Nicole to Keep Calm Craft On and Ginny at Yarn Along. How, you may ask, is it possible to mess up garter stitch? Well, when you have a LOT of stitches on a circular needle and you are knitting back and forth, it's is quite easy to miss the fact that you are at the end of a row. Without realizing it, you (or should I say "I"?) 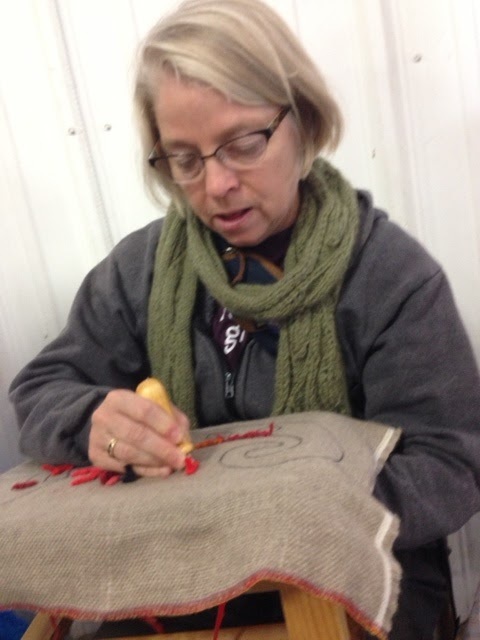 are suddenly knitting in the round. I realized the mistake fairly soon, but I thought I could just cut apart that row and keep going. I am knitting with unspun Icelandic, so I figured I could spit join the little ends. I had knit quite a few more rows -- I'd even begun the next color, a dark blue -- before I realized that the row where I knit in the round disrupted the garter pattern. I had an awkward wedge of stockinette stitch! I guess the good news is that it is possible to frog Icelandic wool and get it back on the needles with no problem. These rows are incredibly long, though, so it's kind of a bummer to have reknit them. But there was no way I could live with a mistake that big! 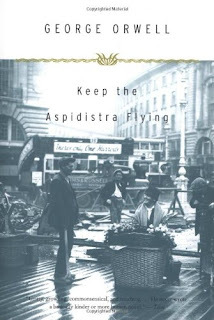 As for reading, I haven't quite finished Keep the Aspidistra Flying by Orwell. That man was an amazing writer. This novel, which looks at the role of money on personal relationships, is both engrossing and thought-provoking. I isn't a beach-type read, however. 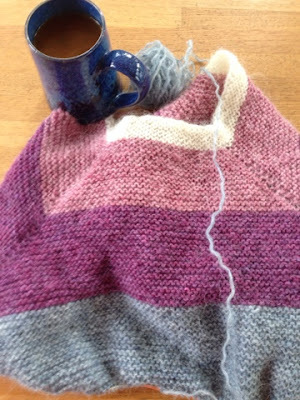 I'm joining up with Nicole at Keep Calm and Ginny for Yarn Along. Weekends Are For Family And Food, Right? It was so much fun having them in town. They spent Friday with my parents and Saturday with us. 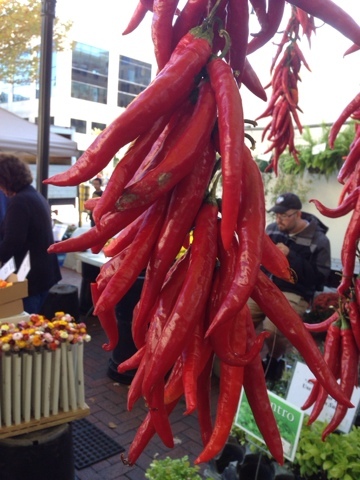 We had a wonderful time shopping downtown. 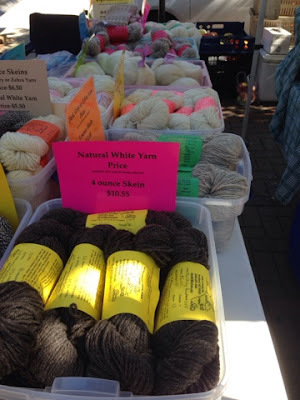 I even discovered yarn at the Market. The vendor doesn't have an online presence, so the market is the only place you can buy her naturally colored wool. 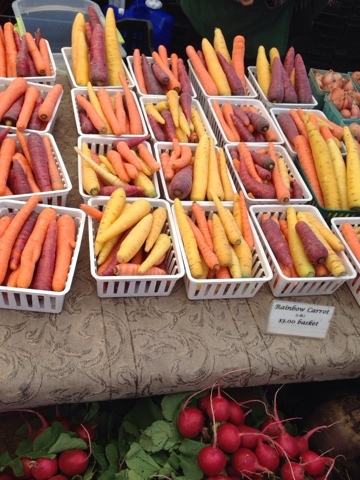 It's all sheep colors, except for a yellow that is plant-dyed. With one sweet bite, 19 days of my no-sweets diet came to an end. Strangely, I don't think I've mentioned this diet on the blog. A few years ago, my friend Tsela came up with the idea of just cutting out all desserts and other sugar-heavy foods. It worked. She lost 12 pounds without altering anything else in her diet. I did it for 30 days a few years ago and did drop a few pounds. I have a very demanding sweet tooth, so the first week is a struggle. But, I swear, if you can stay away from sweets for 7 days, the cravings subside. I have been stuck at a weight that is not only higher than what I want, but above the healthy range for my height, so I dropped sugar at the beginning of September and have been losing a pound a week painlessly. And then I messed it all up yesterday. 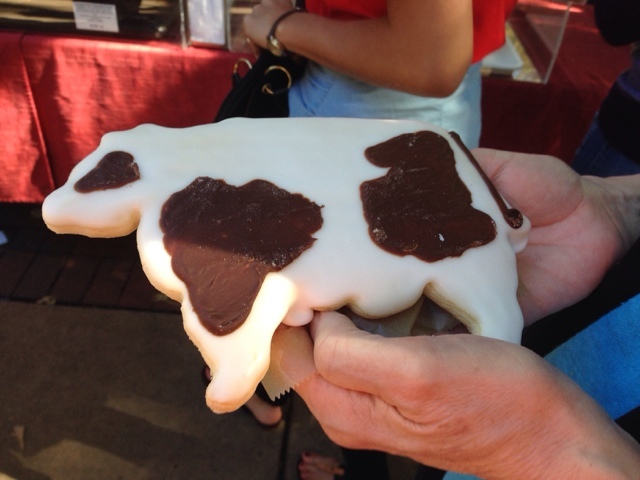 I will say that the cookie was VERY good. Still, I'm kind of mad at myself. But I can't un-eat it. All I can do is reset the clock. It's almost bedtime and I haven't eaten any thing sweet today. Let's call it Day 1. Again! ETA: I did NOT eat the whole cookie. Mary and I shared it! No, I don't have three hands -- although I frequently wish I did. I do want to knit more stranded mittens, but I definitely need a change so I won't make a second pair of these -- at least not for a while. Also, I'm won't know how I'll like the flared cuff until I have a chance to wear these in the cold. I decided not be so dogged with the book I was reading, the popular Dietland by Sarai Walker. I know a number of people who liked it, but the premise of a group of weight-loss guerillas just didn't work for me. Instead, I found myself drawn to a little-know George Orwell novel, Keep the Aspidistra Flying, which is about the lure of money to a failed poet who has renounced the material world. It's rather slow in the Victorian vein, which is fitting as the Aspidistra is a plant that was popular among the Victorian middle class. I am liking it. 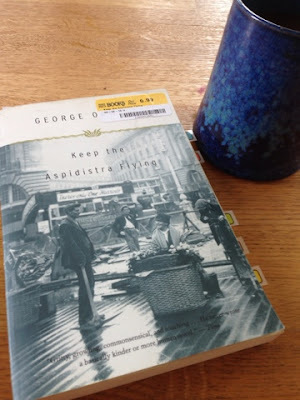 Orwell choses words with care and crafts charming sentences, but I am hoping the pace picks up! Don't forget to check in with Yarn Along. Sheep & Wool: What Could Be Better? I escaped the crazy traffic of Big Ten football yesterday and headed to the rural town of Jefferson for the annual Wisconsin Sheep and Wool Festival. In tow were Suzy and Debbie, two friends I met at the Greater Madison Writing Project Workshop in 2014. It was a beautiful day, perfect for a drive in the country and hours of browsing sheep (and alpaca) stuff. This year, I went with a list of projects I wanted to make and their yarn requirements. I'm not sure this saved me any money, but it did keep me from making too many impulse purchases. Before I left Keith suggested that I go look at my stash to discourage myself from buying anything, but I assure him that wouldn't have make any difference, not once I walked into the marketplace! The pink skein above is for one of Wendy Johnson's Lace Stripe Scarf, while the white and purple will make two sets of mittens. I've promised my friend Marsha that I'm going to teach her how to read a color chart and make mittens, so I picked out yarn and a pattern from the nearby Blackberry Ridge Woolen Mill. The pattern is Bosnian Patterned Mittens. I didn't totally avoid impulse purchases. Isn't this yarn fun? 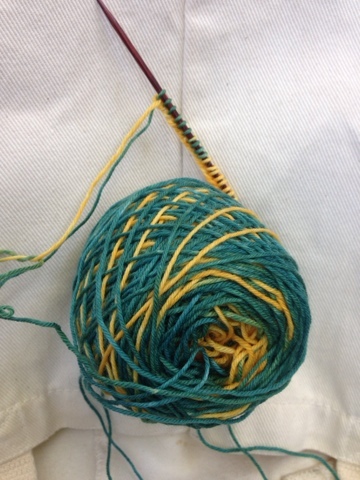 It is destined to be an Octoberfest Shawl. Debbie gave it a whirl, too. 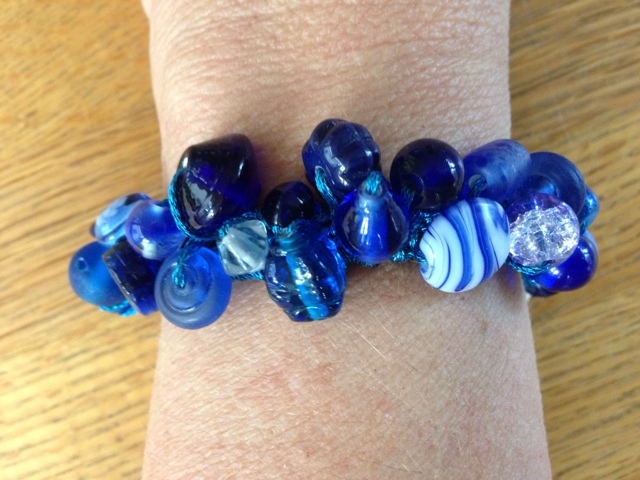 I resisted in an effort to stick with my mantra: No new crafts! 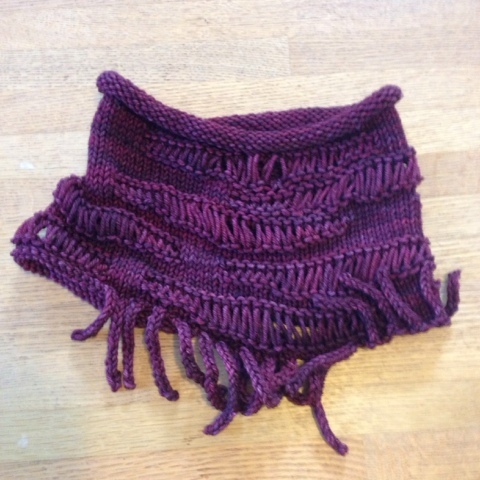 I just zipped through the Shredded Cowl, which is featured on the cover of the latest issue of Knit-Purl magazine and I just love it. I will have to do an FO picture later. 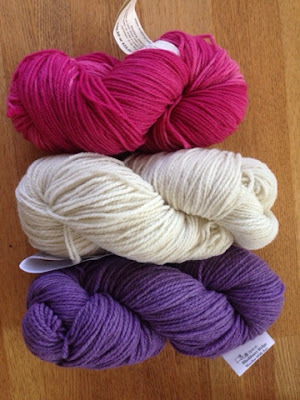 While this photo makes the yarn look purple, it's really a burgundy red. This is a easy project that knits up fast. The downside? Each one of the 19 i-cords has two ends that must be woven in. I didn't mind. I am sure I'll be making more of these. Oh, and it looks great on, too. 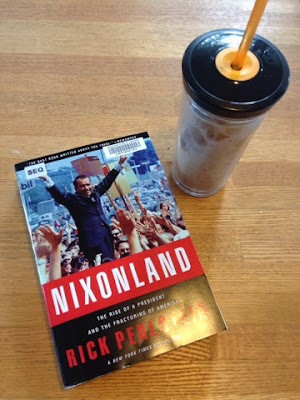 Finally, after three months, I finished Nixonland by Rick Perlstein. 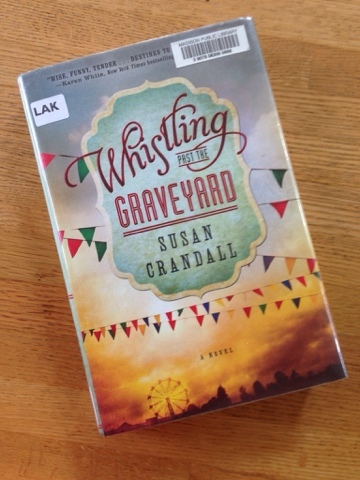 I mostly listened to it on an Audible recording, but I got the book out of the library so I could go back and check things I had forgotten or was confused about. Yes, I listened to all 36 hours! It is a very good book, but also very depressing. I didn't think I could get more cynical about politics, but I was wrong. Nixon was a masterful politician, but he was a horrible man who refused to end the Vietnam War because he thought he couldn't be elected without it. At any rate, I'm actually considering listening to another one of his books. Really, it was that good -- if you love history and politics, that is. I am about halfway through Dreamland: The True Tale of America's Opiate Epidemic by Sam Quinones. It's very interesting, but I hate the way it is structured. The narrative jumps from person to person and issue to issue and then comes back to those people and issues at later points. I've given up on keeping track of the people he uses to tell the story. Somehow, though, it's still quite readable. I've known Ilana since she was in utero and I am so moved by the the strong, loving woman that fiesty little girl grew into. 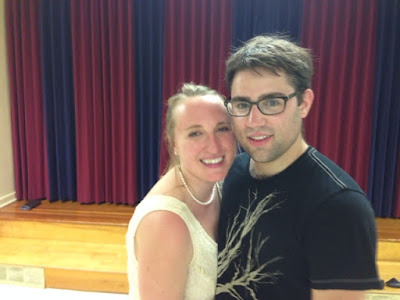 Her mom put together an amazing celebration that went from 1 to 10 p.m., starting in a park and ending with a buffet dinner. I just hope my daughter doesn't think I'm ever throwing a 9-hour party! It was a moving event. These are the moments that make all those years of worry and carpooling and laughing arguing worthwhile. Don't forget to join Nicole for Keep Calm Craft On and Ginny for Yarn Along. I Already Need A Break! After just three days of school, I really need this three-day weekend. Nothing terrible happened, but spending 7 hours a day with middle-schoolers in 90-degree weather and no air conditioning is exhausting! It was an unusually busy first week. I got three new students on the first day alone -- and more will trickle in. We are getting lots of students from Chicago; I suspect that families are fleeing the increasing violence there. 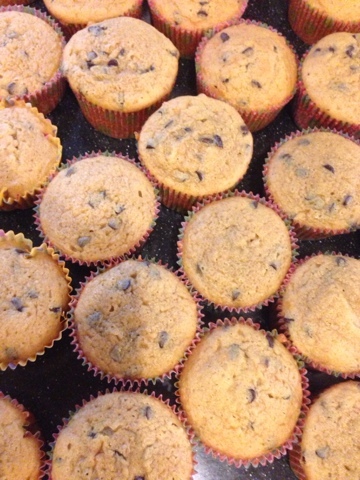 These are the yet-to-be-frosted Cappuccino Chip Cupcakes that I'm making for a wedding picnic tomorrow. Ilana, the bride, loves these cupcakes, so I'm making 80. (The recipe is from the book Cupcakes from the Cake Mix Doctor. It's my favorite cupcake book.) I'm cleaning because at 8 p.m. I will be hosting Selichot, one of the services that precedes the Jewish High Holy Days. Thank goodness we have a window AC unit in the kitchen as it's another hot day! I have feet issues so I have to take regular sitting breaks, which almost always involve knitting. 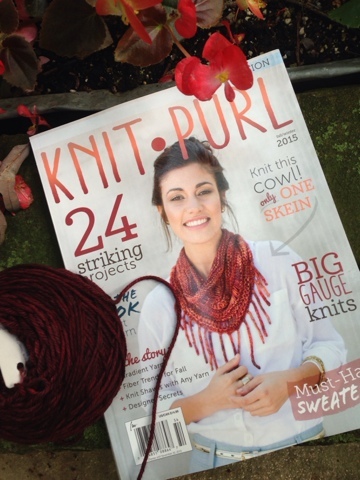 At some point today, I'm going to cast on for the cowl on the cover of the latest Knit-Purl magazine. I'm using Rios, but in a different colorway. It looks like a pretty fast knit. I hope that no one else is suffering in this heat. 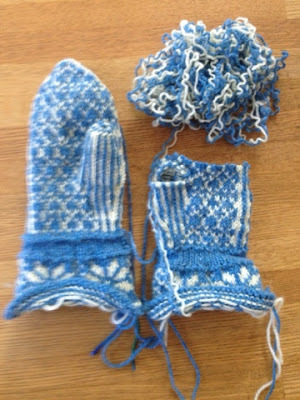 I finished the first Spruce Tree Norwegian Mitten and it looks pretty darn good. However, it doesn't feel good. 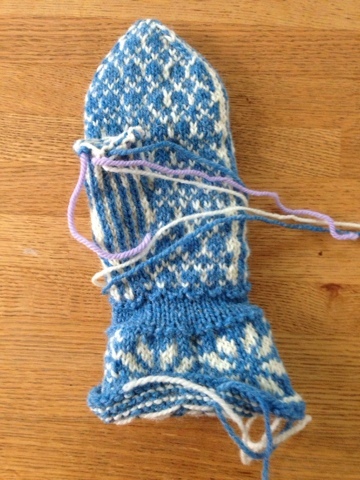 EZ's pattern tells the knitter to decide where to start the thumb. As a result I have a mitten that would fit someone with very, very short fingers. In short, I waited too long! 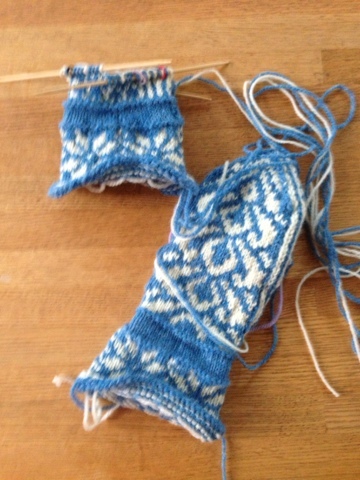 So, I have started the second mitten and I'll see if I can get it right. Then I'll have to frog the entire hand of mitten #1 and do it over. Sigh. Because it's made with worsted-weight yarn, it won't take forever. Which is good because time is in short supply. My students start school tomorrow and it looks like a rambunctious bunch. We are seeing a lot of families moving to Madison from Milwaukee and Chicago. Today's New York Times reports that murder rates are up sharply in both cities, so I have to wonder if there is a connection. 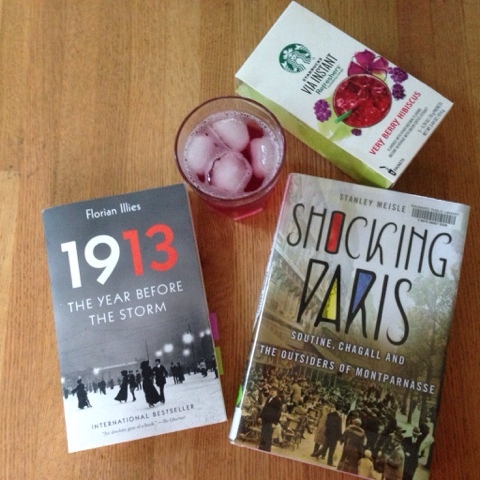 As for reading, I'm finishing up 1913 by Florian Illies. It's a very odd little social/cultural history of Europe on the brink of World War I. It's told in short vignettes that follow the lives of such figures as Freud, Rilke, Picasso, and others I'm less familiar with. I am liking it, but I think it's a book for history buffs. I'm looking forward to reading Shocking Paris, another cultural history, only this one focuses on artists in Paris between the wars. Just in time for school, summer is reminding us that it ain't over yet. Temps are in the high 80's and the 90's this week. Our school isn't air-conditioned, nor is my house. I've become addicted to Starbuck's Instant Via Very Berry Hibiscus. It's kind of like a Kool-Aid for adults. I highly recommend it! I'll be joining Nicole at Keep Calm Craft On.